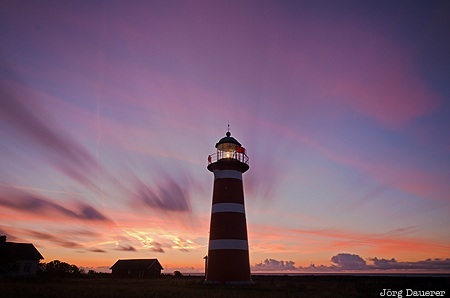 The red and white lighthouse Närs Fyr at the coast of the Baltic Sea in front of fast moving red sunrise clouds. Närs Fyr is in the east of the island Gotland in the south of Sweden. This photo was taken in the morning of a sunny day in August of 2014. This photo is part of the exhibition Moving Clouds (February 2016). This photo was taken with a digital camera.